There are some restaurants that you can never get tired of. One of them is Bangalore Bistro. We went there some time ago and decided that we will not stick to our regular order. And so this time round instead of beers, we decided to go with Sula white wine, which comes at a steep Rs 225 a glass. For starters we decided to have something call Spoony Beef. It sounded really nice and to top it all, it tasted heavenly. The presentation was classic. A square glass dish, with actual spoons of well marinated and tangy chopped beef. This was a bed of lettuce. Each spoon was an absolute delight. It merged the tastes of spicy, tangy and finger licking delicious, all in one. It finally came down to Sudhakar and I assigning spoons to each other. 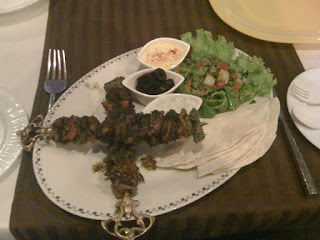 For the main courses, Sudhakar decided to go Arabian and ordered the Lebanese Sheesh Touk. 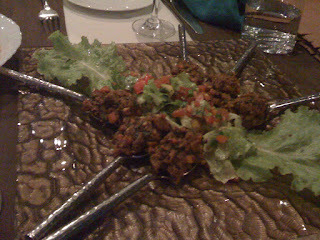 This was skewers of well marinated meat kebabs, the skewers were heavt duty brass. The came along with three portions of Kubbus or Arabian bread, Hummus, a dip whose name I forget and I a olive salad. 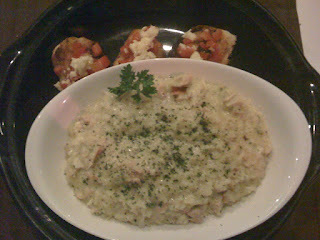 I went in for the Chicken and cheese infused with garlic rissoto (yes I know I said we were trying something new, but I couldn't resist a rissoto. Yummmmmy!!!! This time we really had no place for the desserts, but it was a lovely meal, since Anoushka was well babysitted and we actually had an entire meal without interruptions. The meal turned out to be a tad more expensive thanks to the wine glasses, but it was well worth the money.